Setting an SMTP server for Android is necessary to send out and deliver your emails from your phone or tablet: but don’t worry, the whole email setup is not difficult and it’ll take just a minute. Just remember that if you are using a common SMTP server – like the one that comes with your account on Gmail or Hotmail – you will need to change these settings any time you switch to another ISP. So if you are a frequent traveller, you should opt for a dedicated SMTP service: you configure its parameters just once and it’ll work with any kind of connection. 1. Press “Menu” and tap “Accounts”. 2. Press “Menu” again and tap “Add account”; then enter your email and password, and tap “Next”. SMTP server: your outgoing server’s name. If you don’t know it, you can check our handy list of SMTP settings. Security type: “none” to send without any added security layer; or (as we suggest) you can choose among different type of secured sending. 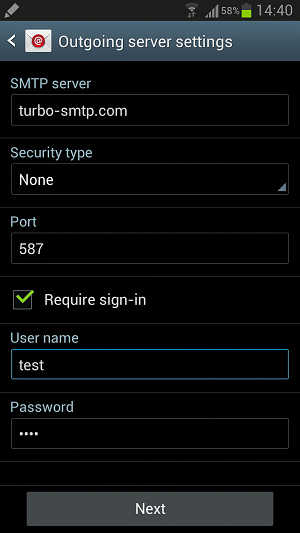 Port: the default port is 25, but you can choose also 587 or 465 if you’re sending out via SSL. For further information check our article about ports for SMTP. And that’s it, your email setup is done and you’re ready to send out messages.